Occasionally, one of my short stories is reprinted in an anthology. Here are the the latest two, both with a common theme. 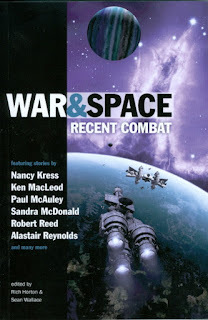 War & Space: Recent Combat, which reprints 'Rats of the System'. 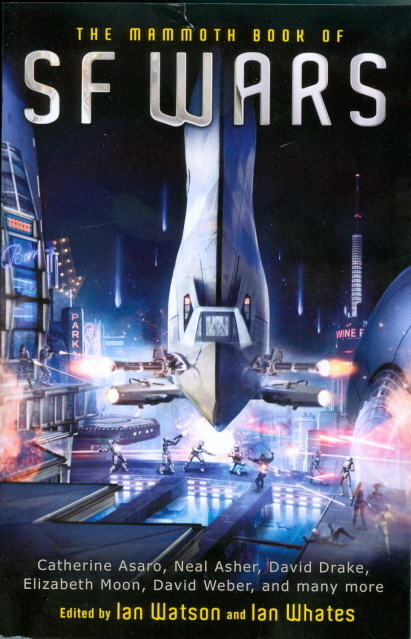 And SF Wars, which reprints 'Winning Peace'. Oh, that perennial topic of SF, war. War as a condition of being human. Or of being intelligent. War as a plot device - a quick and dirty way of putting everything to hazard. Wars asserting human territoriality in a universe that frankly doesn't care - turning the entire solar system, or the entire galaxy, into a battlefield (now there's hubris). Wars fought on the assumption that western capitalism is the best and only model for civilisation that we have. Wars refighting Vietnam on bug planets. The twentieth century stamping its combat boot into the face of humanity, forever. It's heartening that a fair few of the stories in these collections argue against these assumptions, or don't take them at face value. I seem to have been writing a fair bit about war, recently. Or rather, about failed attempts to avoid war, and about the aftermath of war. Readers of The Quiet War, Gardens of the Sun and In The Mouth of the Whale will know that I'm not especially interested in generals and admirals, and the tactics of epic space battles. 'Rats of the System' is a quick little story about two mismatched people trying to escape an implacable pursuer; 'Winning Peace' is about two former enemies finding a common cause. And right now, I'm finishing a novel in a post-war, posthuman future without a space battle or space marine in sight. Heading out of the world-city Ophir to the semiautonomous free zone of Tannhauser Gate.